Skinny pigs are born without any fur – and stay that way. The only fur they have even when they are older, is found on their noses and feet. Skinnies cannot live outdoors because they feel the cold too much due to the fact they have not fur. They must live in a warm, heated house. 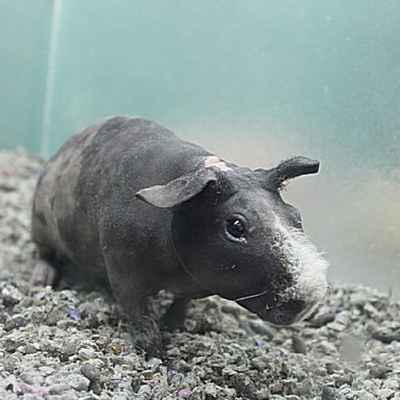 If you take your skinny pig outside in the summer, you would need to put sunscreen on them to protect their delicate skin from being burnt – sun factor 50+ is the ideal choice. 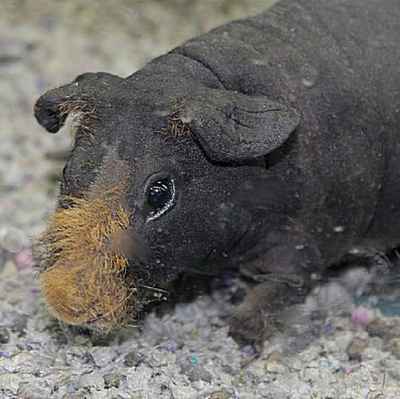 Skinny pigs have a higher metabolism than guinea pigs with fur because they need to maintain their body heat. This means they eat much more food, munching away all day if possible. Skinnies can be a lot messier than their furry counterparts – this means they need cleaning out a lot more frequently. 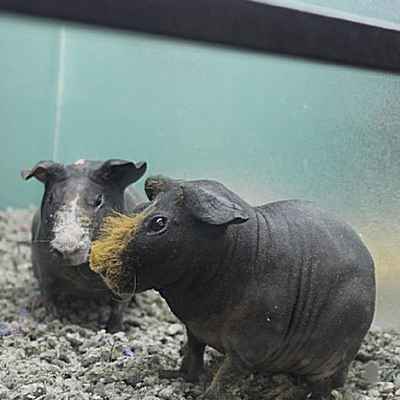 Skinny pigs can be much noisier than their furry counterparts too. Skinnies are very quick to learn, and recognise things pretty fast as well, especially the sound of a fridge door opening or the rustle a bag that might contain food – they soon let you know they have heard what is going on even when in a different room. Skinny pigs like their hairy brothers and sisters, are very entertaining little animals with each one of them having their own unique personalities. Skinny pigs if well looked after can live up to six years of age. They love the company of their own kind – and they adore having lots of attention paid to them by their owners. If well handled right from birth, skinny pigs are extremely affectionate family pets with the males often being more loving than females!